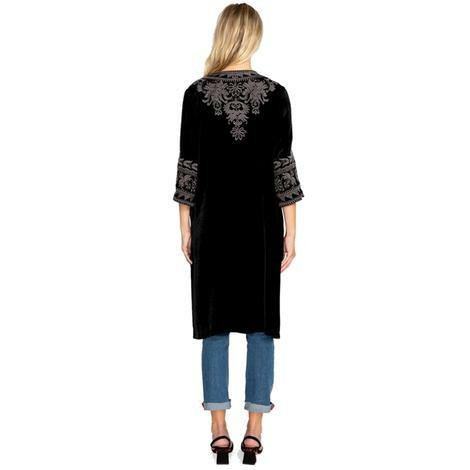 Johnny Was women's black crochet jacket is the perfect topper for and evenings attire. Sheik and delicate crochet composition with full length sleeves and a mid-thigh arched hemline. Complete with two convenient pockets and an open draped fit in the front. The beautiful downy velvet cover-up in duster style has a silvery white pattern with ¾ length sleeves. Falls to calf, with side slits. Embroidered pattern on the shoulders, back, mid-calf, and up the arm and down to the hemline.